Merrick Garland would shift the Supreme Court left. A lot. It’s why Republicans are vowing to block him. Supreme Court nominee Merrick Garland in the Rose Garden on March 16, 2016. 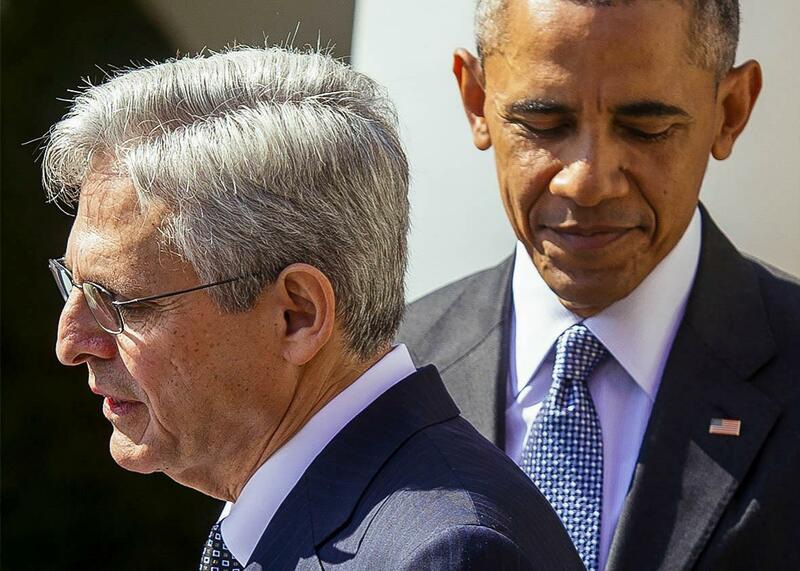 Since his nomination by President Obama for the vacant Supreme Court position on Wednesday, everyone has been describing Merrick Garland as a “moderate”—as in a “moderate liberal.” The idea is that Obama—either out of statesmanship or as a tactical maneuver—has made an offer to the Republicans that they can’t refuse: a highly competent and experienced judge who won’t overturn conservative precedents but also won’t make new ones. An old white guy, Garland won’t even offend the Trump wing of the Republican Party who see racial favoritism everywhere. How could the Republicans say no? Actually, they could easily say no. The Supreme Court is one of the most polarized institutions in American society. The conservative justices seek to strike down liberal laws, and the liberals seek to strike down conservative laws. Liberal academics and journalists have peddled the myth that the conservative justices are extreme reactionaries while the liberals are moderates who respect precedent. The truth is that the liberals respect liberal precedents—those from the Warren Court era of the 1950s and the 1960s, which have not (yet) been steamrolled by the conservative majority. Those liberal Warren Court precedents are, incidentally, opinions that disregarded the (conservative) precedents of the time. The political scientists Lee Epstein and Andrew Martin looked at the data using regression analysis and found that conservative justices generally vote to strike down liberal statutes and liberal justices generally vote to strike down conservative statutes. After controlling for irrelevant differences in the cases, the authors find that the Republican appointee Chief Justice John Roberts voted to strike down liberal laws 46 percent of the time and conservative laws only 17 percent of the time. For Samuel Alito, the numbers are 54 percent and 2 percent. The pattern holds, but in the opposite direction, for the liberal justices. Justice Ruth Bader Ginsburg, appointed by Bill Clinton, voted to strike down conservative laws 67 percent of the time, and liberal laws only 17 percent of the time. For Justice Stephen Breyer, the numbers are 53 percent and 16 percent. How would a Justice Garland fit in? I have tried to figure out why people think that he is a “moderate liberal.” He does not have a history of political activism but hardly any Supreme Court justice does. Tom Goldstein, a lawyer and Supreme Court expert, read Garland’s opinions back in 2010 and observed that Garland frequently voted against criminal defendants. Garland was a prosecutor, and may well be less sympathetic to criminal defendants than most liberals are. But he seems liberal on regulation, civil rights, and environmental law. It’s true, though, that one cannot predict much from the votes of an appellate judge. Circuit judges, unlike Supreme Court justices, do not make law, and they almost always vote the same as their colleagues. Everyone scratched their heads when Sonia Sotomayor, John Roberts, and Samuel Alito were nominated as well. Their opinions revealed almost nothing about their politics. Prosecutorial background also reveals little; Sotomayor and Alito were both prosecutors, and now they vote in opposite directions on criminal cases. Epstein does point out, though, that the ideology of the president who appoints a justice is a reliable predictor of how the justice will vote on the Supreme Court. If the pattern holds for Garland, Republicans have much to fear from him. Whether you think of Garland as an ideological soul mate of Bill Clinton (who appointed him to the D.C. Circuit Court) or of Obama (who is trying to appoint him to the Supreme Court), his voting on the Supreme Court will be hard to distinguish from that of the current four liberal appointees. Two of those justices were appointed by Clinton and two of them were appointed by Obama, but all four vote nearly the same, solidly on the liberal side of the spectrum. Whether Garland votes as a liberal or a moderate liberal, this means the court will shift radically from the right to the left. The reason is simple. A conservative 5–4 majority has piled up numerous conservative precedents over the last 20 years on ideologically charged topics ranging from gun rights, to affirmative action, and campaign finance. If Garland is confirmed, the balance shifts to a 5–4 liberal majority. No one would be surprised if the four current liberals would vote to overturn or cut back these conservative precedents if they were in the majority, though they might extend the counterrevolution over a few years for the sake of propriety. While Garland’s supporters say that he’s too much of a “judge’s judge” to reverse course and vote with the other liberals and overturn these precedents, there is little reason for Republicans to believe this. Liberals believe, with their heart and soul, that the conservative precedents are illegitimate, based on a false ideology known as originalism as well as brute political force. Illegitimate precedents are not entitled to deference. Think of it this way: the moderate conservative Anthony Kennedy has been the decisive vote on a host of politically charged issues, in essence the court’s median voter. With Garland on the court, that median voter becomes either Garland or (if he turns out to be less than moderate) one of the current liberals, and it moves well to the left on most, if not all, issues. Of course, Republicans might think that Garland would be a better justice for conservative causes than anyone Hillary Clinton might appoint if she wins the presidency. She could select someone who is not only more liberal than Garland but younger. But a more liberal version of Garland is actually no worse than Garland himself. Once the court tilts to 5–4 liberal, it will mow down the conservative precedents; it doesn’t matter whether the next justice is the least or most liberal of the five. And with a life expectancy of 20 years in a political climate that cannot see beyond two, Garland might as well be immortal. Of all the bizarre and broken features of the American political system, the selection of Supreme Court justices tops the list. The justices claim the last word on the most controversial issues of our time—abortion, gun rights, religious freedom, affirmative action, gay marriage, campaign finance. Yet they are unelected, unaccountable, out of touch—drawn from a tiny elite of Ivy League–educated lawyers—and completely inexperienced in politics. Possibly to resolve the cognitive dissonance of elite rule in a democracy, the myth has arisen that the justices decide these issues by applying the “law” when in fact they apply their ideological commitments in legal guise. So powerful is this myth that it would be considered the highest breach of political etiquette for anyone to ask Judge Garland for his views on the very political controversies he will resolve. Not only are we denied the right to vote for or against this man who will decide these issues for the next two decades at least; we are not even allowed to know what he thinks.